Mic'd Up production dialogue. The AKG mic worked really well, especially for men. It really brings out the richness in men's voices. In Moonrise Kingdom, we used the AKG Perception 420 on actor Larry Pine. Since then we've done another film with Pine where he's just the narrator, and we used that same mic." ADR mics are important, but so is match- ing the original performances in tone and going to drop in unless the performance is right. The range of their voice has to match, and it has to feel right." HEARTLAND, FLASHPOINT Technicolor Toronto (www.technicolor. com/toronto) has five ADR rooms that range from a small iso-booth to a large, open-con- cept room with movable walls and ceilings to accommodate recording of interior or exterior environments. According to James Porteous, manager of sound services at Tech- nicolor Toronto, "It's a class-A NC15 room that is invaluable for getting a match between ADR and the origi- nal location dialogue because the room can be changed to match the required environment." The studio performs ADR for several Canadian series, including Technicolor Toronto provides ADR for the TV series Flashpoint. Richard Calistan records the group ambience with the Neumann TLM 103. feel. To achieve a great read, director Wes Anderson had the actors perform their lines wild, not synced to picture, as he gave them direction. For each take, there was the usual three-beep with the first read in sync with picture, but then the actor would just keep repeating the line until the director felt it was right. Instead of one read per take, there was up to 20 reads per take. Anderson focused more on capturing the performance than on capturing sync. "This made it a little difficult later to put the line into place, but it was a good method because it freed up the talent to get more comfortable with the line, the read and per- forming it a little better," says Ryan. "With ADR, more than the mics, it's all about per- formance. You could record it with the most expensive mic in the world but it's never Heartland and Flashpoint. Richard Calistan, senior ADR recordist at the studio, set up the open-concept ADR room to mimic the recording set-up for the location sound. Instead of a traditional studio con- sole, he chose a Mackie console popular with location recordists. Also, the room is open-concept, meaning the ADR recordist, the talent and the mics, the director and the producer are all in the same room. "Even the electronics are close to the original recording, so it seems just that little bit extra, as far as making the audio match the original production track, really helps," says Calistan. "It's a very com- fortable environment." 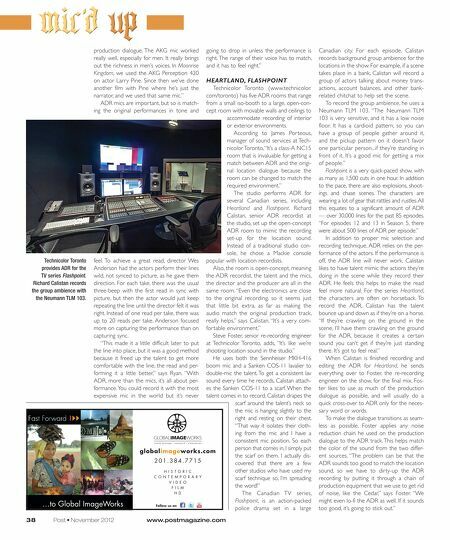 Steve Foster, senior re-recording engineer at Technicolor Toronto, adds, "It's like we're shooting location sound in the studio. " globalimageworks.com 201.384.7715 HISTORIC C ONTEMPORAR Y VIDEO FILM H D 38 …to Global ImageWorks Post฀•฀November฀2012฀ He uses both the Sennheiser MKH-416 boom mic and a Sanken COS-11 lavalier to double-mic the talent. To get a consistent lav sound every time he records, Calistan attach- es the Sanken COS-11 to a scarf. When the talent comes in to record, Calistan drapes the scarf around the talent's neck so the mic is hanging slightly to the right and resting on their chest. "That way it isolates their cloth- ing from the mic and I have a consistent mic position. So each person that comes in, I simply put the scarf on them. I actually dis- covered that there are a few other studios who have used my scarf technique so, I'm spreading the word!" The Canadian TV series, Flashpoint, is an action-packed police drama set in a large www.postmagazine.com Canadian city. For each episode, Calistan records background group ambience for the locations in the show. For example, if a scene takes place in a bank, Calistan will record a group of actors talking about money trans- actions, account balances, and other bank- related chitchat to help set the scene. To record the group ambience, he uses a Neumann TLM 103. "The Neumann TLM 103 is very sensitive, and it has a low noise floor. It has a cardioid pattern, so you can have a group of people gather around it, and the pickup pattern on it doesn't favor one particular person...if they're standing in front of it. It's a good mic for getting a mix of people." Flashpoint is a very quick-paced show, with as many as 1,500 cuts in one hour. In addition to the pace, there are also explosions, shoot- ings and chase scenes. The characters are wearing a lot of gear that rattles and rustles. All this equates to a significant amount of ADR — over 30,000 lines for the past 85 episodes. "For episodes 12 and 13 in Season 5, there were about 500 lines of ADR per episode. " In addition to proper mic selection and recording technique, ADR relies on the per- formance of the actors. If the performance is off, the ADR line will never work. Calistan likes to have talent mimic the actions they're doing in the scene while they record their ADR. He feels this helps to make the read feel more natural. For the series Heartland, the characters are often on horseback. To record the ADR, Calistan has the talent bounce up and down as if they're on a horse. "If they're crawling on the ground in the scene, I'll have them crawling on the ground for the ADR, because it creates a certain sound you can't get if they're just standing there. It's got to feel real." When Calistan is finished recording and editing the ADR for Heartland, he sends everything over to Foster, the re-recording engineer on the show, for the final mix. Fos- ter likes to use as much of the production dialogue as possible, and will usually do a quick cross-over to ADR only for the neces- sary word or words. To make the dialogue transitions as seam- less as possible, Foster applies any noise reduction chain he used on the production dialogue to the ADR track. This helps match the color of the sound from the two differ- ent sources. "The problem can be that the ADR sounds too good to match the location sound, so we have to dirty-up the ADR recording by putting it through a chain of production equipment that we use to get rid of noise, like the Cedar," says Foster. "We might even lo-fi the ADR as well. If it sounds too good, it's going to stick out."